I don’t quite know how to start this rather daunting task of summarising all that was nourishing from OpenEd15 this year. The conference community of open education practitioners, advocates, teachers, instructors, librarians, policy makers and commentators, simply continues to grow. What struck me this year was the diversity of the delegates and like a good stock, there were several strands of inquiry that had simmered over the years and that were coming into fruition. Of course there were high-profile projects and areas that attract current investment. That is typical of any innovation at any moment in time – there will always be the big shiny projects, the luxury croutons floating bobbing about in the open education soup. What also was apparent were corners of the open education movement starkly absent – no mention of open courses or massive online open courses at all. So for me just yet, the seasoning is not quite right, because we are all in this soup together, and we all need to be. This session blew me away and we’d barely started. The BC Campus team organised a sprint and produced a draft on an open textbook in four days. What interests me is how open text books have had no traction in the UK with the assumption that students do not purchase books, or teachers do not adopt one book and focus in this way. The reality is, we just don’t know. It is also impressive that a number of the textbook projects aren’t just working within one institution – this project involved faculty (teachers) from 4 post-secondary institutions in British Columbia with the aim of writing a first year Geography textbook, and that is what they did. I liked the careful choice of the team – teachers, librarians, instructional designers and a facilitator. It must have been an exhausting but exhilarating process. The draft book underwent peer review with further colleagues to engage them in the process. Those involved said it was an interesting experience to pass their writing on and let go of the ownership of it. The book included presentation slides and a question bank, because a recurring barrier to faculty adoption of open books is the lack of ‘goodies’ that come with texts. What would they have done differently? More pre-work to identify background material to reuse. Everything was CC licensed. State learning goals up front. Help students not feeling overwhelmed. Time management and help students with their perception of time and how long something might take. How to manage independence rather than dependence on tools. Get them to find things that are useful to them. Project 1 – BC Campus is using open textbooks with students with print disabilities, leading to a toolkit on accessibility for those wishing to author books. Project 2 – CAST – a project with colleges to develop OER aligned with Universal Design For Learning (UDL) guidelines. This includes the Accessible Educational Materials (AEM) Center. Project 3 – FLOE – also striving toward inclusive open education. Paul based some of his thinking on the open pedagogy work of Bronwyn Hegarty and Grainne Conole. Paul made the distinction between digital literacy and information literacy, and how open education can be a doorway in to discussing these tricky topics with learners, a group often overlooked. By linking open pedagogy to information literacy, Paul has been running sessions to talk to students about awareness, collaboration, finding, evaluation, understanding and the need to be safe. Paul presented this as his open pedagogy playlist of ideas which was awesome. He talked through how engaging students in open exploration on the web helped build some fundamental skills, and that often the emphasis is on the technology and tools. In reality we should be helping learners and teachers explore the more social and human-facing aspects of interacting online, creating social media profiles and what it means to be socially responsible. He epitomised the central role of library services in developing the open agenda through learner-facing sessions, and running open courses immersed in open practice and tip-toeing toward the exploration of open pedagogies. “The presentation of self in everyday life” by Erving Goffman in 1956 is a lovely exploration of what is self and how we promote or ‘perform’ in different contexts. Goffman examines what behaviours contribute to our social identity and status, and what forces come into play. John rather beautifully drew parallels with the online world, and some of the approaches he takes working with learners and teachers to explore their ‘online’ self in everyday life as part of a publishing course PUB101. Where better to start to learn the principles of modern day publishing with trying to publish yourself. John’s approach with his students reminded me of the epic John Coltrane piece where Coltrane starts off with the solo and ends up with the theme – not very conventional and very much playing the piece backwards. John’s approach with students is also quite radical where they are let loose with their own digital devices and tools, and work from there to build identify and collaboration. Rather than presenting students with a formal structure – it must be so – the learning is enriched from their experimental approaches. Challenges for John were in how to assess and align with institutional requirements without quashing individual expression. He achieved this by assessing the writing level and not the content. Learners were given free reign to build anything but only their reflective writing was assessed. What are we publishing online – ourselves and our lives? Who is your audience, voice, audience, ownership of you and your brand? How do you measure audience interaction and responsiveness? How to validate user generated content? Fear of open in some business sectors – how to earn revenue? How to be sustainable? Business and financial models will destroy the ‘spirit’ of openness. Open works for public sector but what about for-profit? Paul has since gone on to apply the business model principles to a series of open tools and design platforms as a feel for their social value proposition and stance on openness, e.g. Flickr, Hubert Project, YouTube, Lumen, and many other examples. This is part of on-going work and he is looking for other business volunteers, and what is emerging is a fascinating picture of how open and business can rub shoulders without losing the social values and principles of open. Application? 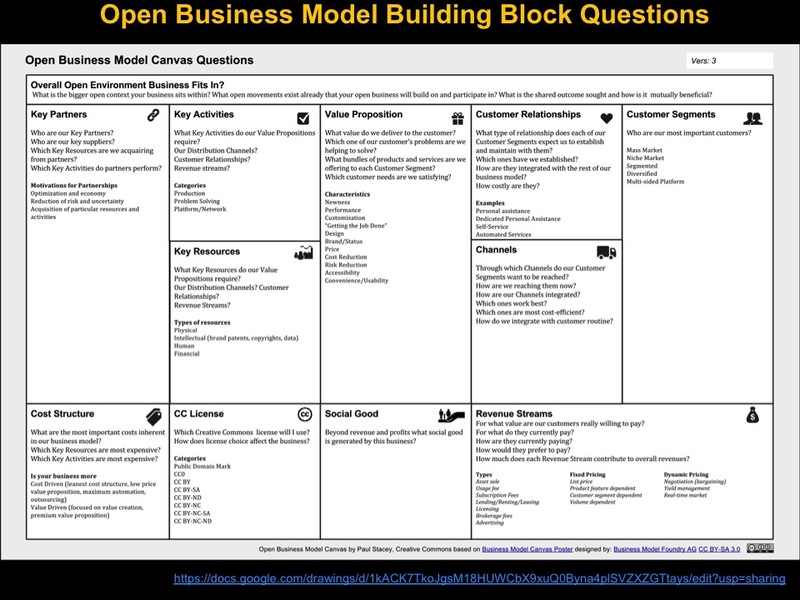 This is going to give us clues of how open can be scaled and sustained across a wider range of business models, and that multiple means of open is acceptable. Value Proposition Design – collaboration between multiple authors across the globe. A delegate Tweeting from #cmd2015 about lack of reading activity in residential homes just at the point I was listening to Hugh McGuire’s amazingly fantastic work to produce an open audiobook resource Librivox. This entry was posted in Blog and tagged opened15 by admin. Bookmark the permalink.